What is Wysong Archetype Burgers Dog & Cat Food? Archetype burgers are a unispecies food that can be given to both dogs and cats. The round patties are packaged in a reusable and recyclable (#2) plastic container. You can feed the burger patties dry (whole or broken into pieces), or you can break up the burgers into pieces and add equal parts of water to create a stew-like food. And they're great for people who'd like to serve their pet a raw food diet but don't have the time. Wysong foods, including Archetype Burgers, are made in the USA at their own facilities with USDA- and FDA-approved domestically sourced ingredients, so you can feel good about what your pet is eating. 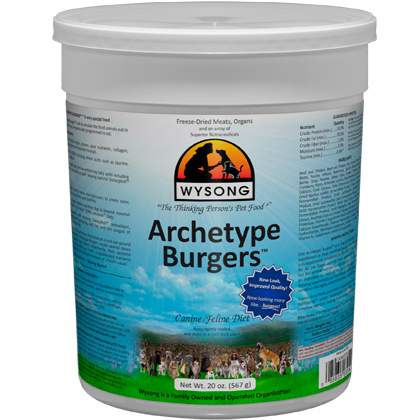 Wysong Archetype Burgers are made with raw meats, organs, bones, collagen, proteoglycans (chondroitin, glucosamine), prebiotics and probiotics, and enhanced with phyto-nutrient, antioxidant-rich fruits, and vegetables that have not been heat-degraded, and thus retain much of their nutritional value. Wysong combines their TNT (true non-thermal) freeze-dried technology with a burger-like patty to give all of the benefits of a raw diet in the convenience of a dry food with very high protein content (at least 50%). This product contains raw meats. Use the same precautions you would with any other raw meat. Wash hands and surfaces after contact. Keep product away from children. Any sudden change in diet may result in digestive disturbances. Wysong Archetype Burgers is a unique formulation, and should be gradually introduced. Over a period of 15 days, mix Archetype Burgers with the present diet beginning at about 10% and then gradually increase proportions. If difficulties arise, return to a smaller percentage and try again. If your pet prefers a wetter food, you can rehydrate the burgers for a more stew-like food. To do that, break up the burgers, add equal parts, water, wait 20 minutes for rehydration, and serve. The following amounts suggested should be decreased in proportion to the amount of supplementation with fresh whole foods, or other foods provided in addition to Archetype. Wash working surfaces, utensils (including preparation and feeding bowls), hands, and any other items that touch or contact raw meat or poultry with hot soapy water. Refrigerate or discard leftovers immediately.